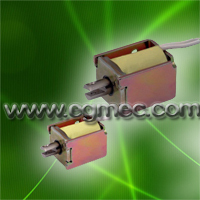 Electromagnetic solenoids in the automatic control system in machine tools is the electromagnetic energy into mechanical energy of the electrical components, it is mainly controlled by the contactor or relay off its power. DC and AC solenoids are divided, commonly used in magnet machine can be divided according to their role in traction magnet, brake solenoid and solenoid valve and so on. Magnet traction control system in machine tools is mainly used as repulsion or pulling mechanism. It is mainly from the core, armature, and coils. Coil power, the iron core to attract the armature, the mechanical traction device. Braking and traction solenoid magnet is not fundamentally different, are also energized by the coil, the core generates suction to attract the armature, the armature brake traction device of the motor brake or loose Open the brake. Brake solenoid with AC and DC to the other; single, three-phase to the other; have power brakes and power brake points. Under normal circumstances the use of power brake solenoid, that motor is energized, the brake solenoid coil is energized, then release the brake; when the motor lost power. Brake solenoid coil is energized, the brake device under the action of spring force, clinging to the motor shaft brake motor, the motor quickly to stop. Solenoid valve solenoid valve is mainly used in the. Solenoid valve in the machine's hydraulic system used to change the direction of liquid flow, liquid distribution, oil and so connected and close. There are two two-way valve, 4/2-way, 4/3-way, three five other structures. Solenoid valve with AC and DC of the points, depending on the power control system may be used.